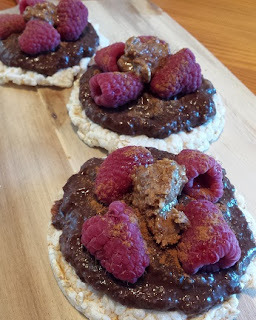 Today's prompt for vegan mofo is snacks without packaging. 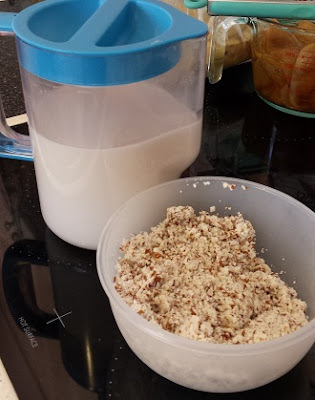 I shared on my facebook page a video of how quick & easy it is to make homemade almond mylk. It's as simple as blending soaked almonds with water and straining the mixture! You can, of course, add any vanilla or sweeteners that you desire. Even though this way of making almond mylk, most times, ends up less expensive than store bought versions, and without the additives that are so common in plant based mylks, the end result of making your own mylk is pulp! Now if you're like me, you don't want to just throw it away..... so the question remains, what to do with all the pulp! 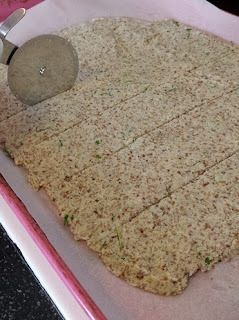 My daughter loves these crackers made from the almond mylk pulp! 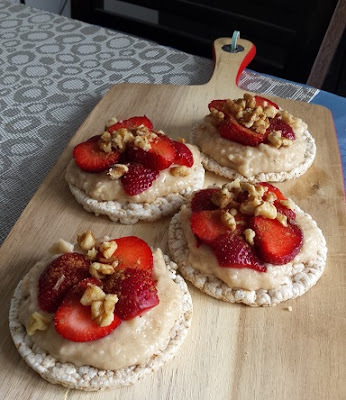 They are easy to make and are a great snack or addition to a lunch plate. In a mixing bowl combine all the ingredients together. spoonfuls of water until the mixture is just combined. 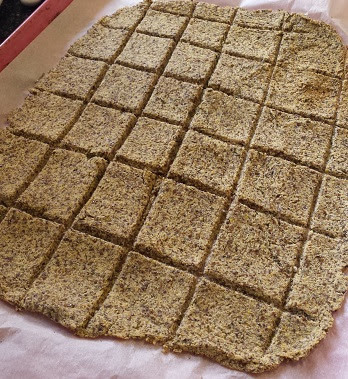 Line a baking tray with baking paper and spread the mixture over it. to roll out the mixture until approx. 1 cm thick. Using a pizza cutter score the mixture. crackers are crisp, golden and cooked through. Do you make your own motherless mylk? If so, which type do you make, and how do you use up the pulp? Today's mofo prompt is "Spicy without chilies". Mexican food also had a lot of flavour. and for those of you who do like heat you can always add some chili in! This is a meal idea without exact quantities stated. The reason I do this is because I always like to encourage people to get experimental in their kitchen and enjoy the cooking process. It a wonderful way to realise that creative meals don't have to be time consuming or difficult to make. 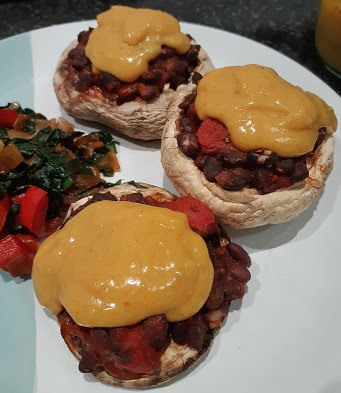 Whenever I make meals like this I make a comment to my husband "It's not that hard to make quick, easy yet enjoyable vegan meals! Why do some restaurants find it so difficult!" Place them in a microwave proof container with 1cm of water and heat for 2 mins. This helps to soften them and significantly reducing oven cooking time. In a mixing bowl combine the black beans, tomatoes and spices. Drain the water from the mushrooms and place them in an oven proof dish. 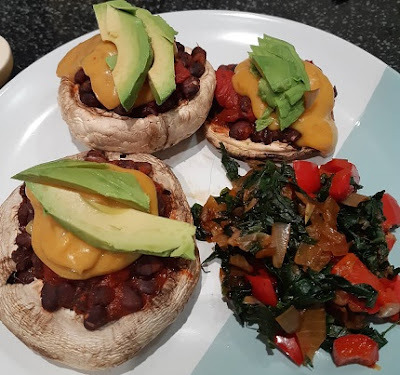 Fill the mushrooms generously with the black bean/tomato mixture and bake in a preheated 200°C oven for 15-20 minutes until mushrooms have cooked through and the black bean mixture is hot. and serve with slices of fresh avocado. at a restaurant I'd be more than happy! What do you reckon!!! Does it look fancy enough to be a restaurant meal? What meals do you make at home that are a little bit fancy? Today's vegan mofo theme is "Dessert without added sugar"
In my opinion there's no better way to value the natural sweetness of fruit than by drastically reducing your sugar intake. And not just "sugar" but all forms of added sweeteners. 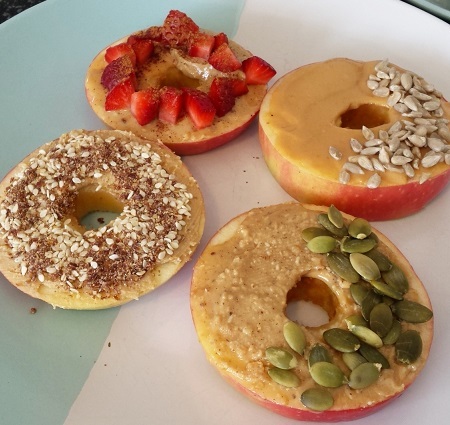 BUT have you ever seen apple donuts??? 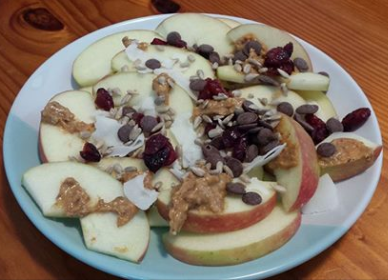 Here's a bit of fun way to eat apples to give you inspiration for a tasty & healthy dessert without any sugar! Slice apple into 1cm thick pieces across the core. Cut the core out using an apple corer. Spread with a variety of nut butters. Top with seeds and/or fresh or dried fruit. What's your favourite fruit to eat? 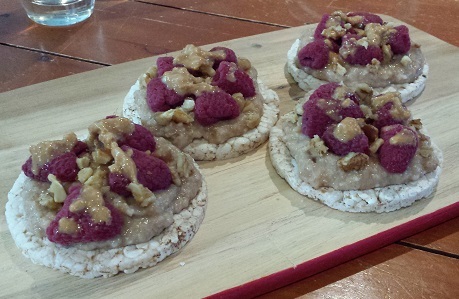 I would have to say that probably raspberries and mango are my favourite fruits, but I sure do love a fresh crisp apple with nut butter too! 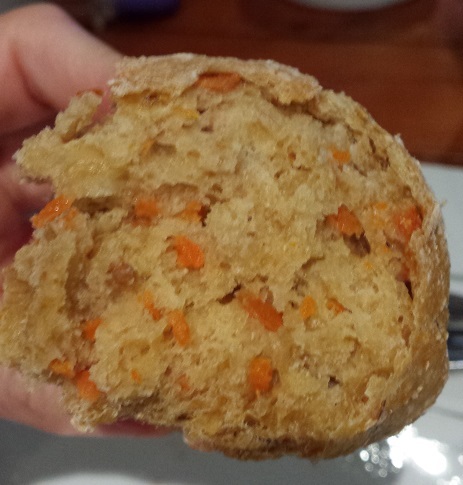 Today's vegan mofo prompt is "Baking without Gluten". 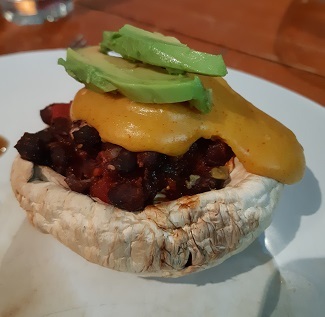 Whilst this recipe *may* contain gluten due to the oats, it is a flour free recipe which is something that is very relevant to me as I shared in my Introduction Post! 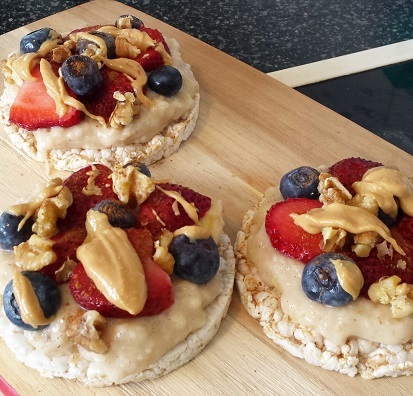 For a guaranteed gluten free version you can substitute quinoa flakes in place of the oats. 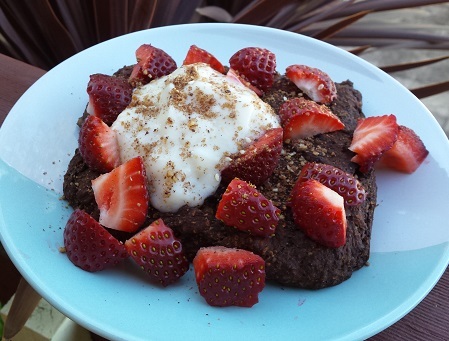 I am quite enjoying my flour free life and with delicious breakfast treats like this, it's no wonder that I am not feeling deprived at all! It would also make a great dessert for anyone who wants a little after dinner treat! 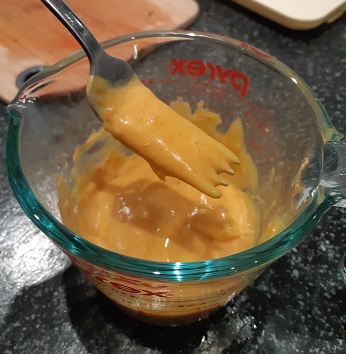 Combine all the ingredients together in a mini food processor and pulse until lightly combined (best to keep some chunks for added satiety - Chew your food!). 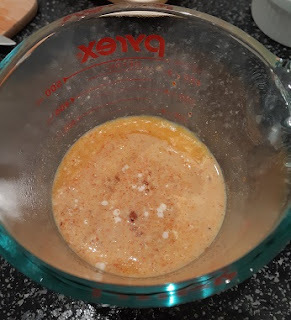 Add a splash of water if it's needed to combine the mixture into a thick batter. The water may or may not be needed depending on the size and ripeness of your banana and how well your beans are cooked. Pour mixture into a silicone baking mould. I press my mixture into a quarter of a large square one. It doesn't spread as it cooks so this works well. 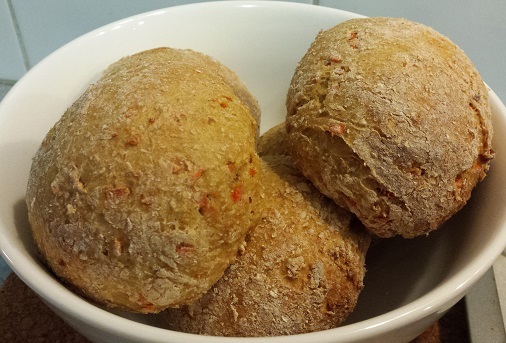 Bake in a preheated 200°C oven for 20 minutes until cooked through and edges are crispy. 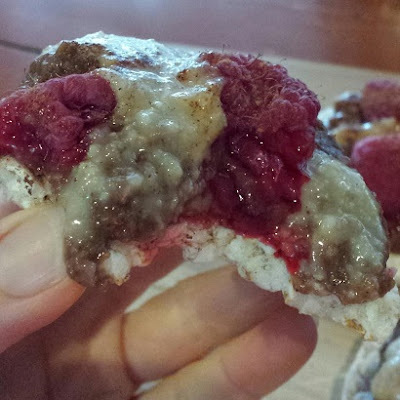 Delicious served with yogurt and berries. Showing the pieces of banana and beans so you can see it's not pulsed thoroughly. *I find this sweet enough with just the banana, however if you'd like a sweeter version you can add 1 Tablespoon date paste to the batter. *Multiply quantities if you want to make a multiple serves. Week 2 of Vegan Mofo already! 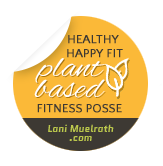 This week's theme is "Dietary and Lifestyle Restrictions". 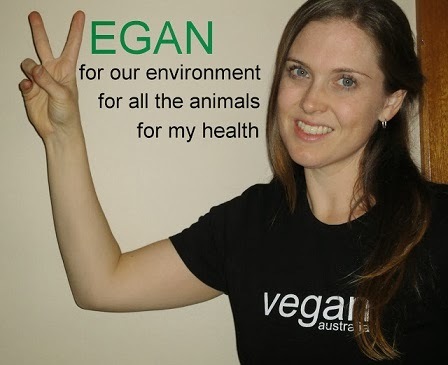 Personally I don't consider 'vegan' to be a dietary restriction. 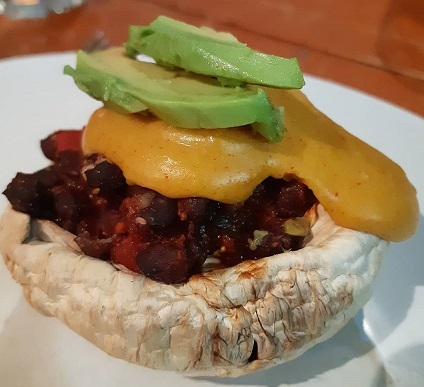 In fact I have found it so freeing to be vegan and since going vegan I have definitely broadened my food intake by consuming a much bigger variety of foods than I ever previously tried. Sadly, lots of people do consider being vegan a restriction. Yet within the vegan community there are so many other restrictions as well. Not only are their people who are genuinely celiac, or have anaphylactic allergies there are also those who choose to abstain from various categories of food for other reasons. Nuts in a popular one that is restricted by those choosing to avoid high fat foods or hoping to lose weight. Today's prompt is "Creamy without Nuts". Many creamy recipes and dishes require nuts, and copious amounts of them. 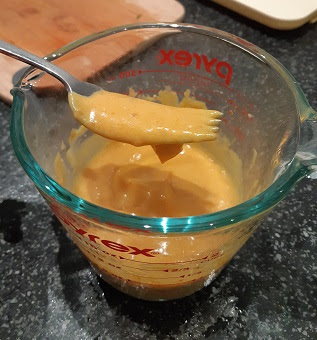 Today I bring you a nut free cheese sauce that is low fat and super easy to make. Combine all the dry ingredients in a microwavable glass jug with at least double the capacity. Whisk together and gradually add the milk making sure all the powders dissolve completely. Microwave on high for 1 minute. It will begin to thicken and you will see a skin forming over the top. Whisk together the thick parts with the runny parts. Return to the microwave for another minute. Whisk together again as the top is always more thick than the bottom. It will thicken further on standing. This is quite thick so it makes a great topping over recipes. Serve it straight away if you want to be able to pour it or if you want to use it as a 'cheese slice' type substitute, you can allow it to cool more and it will go thicker and then you can gently spread it over your dish. 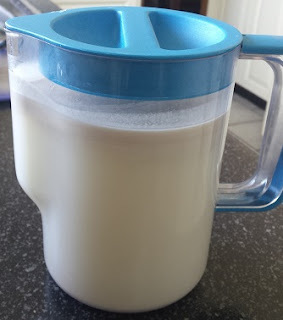 If you want it much thinner, you can add another 1/2 cup soymilk or water. This can also be made over a stove top by stirring constantly over low heat until thickened. 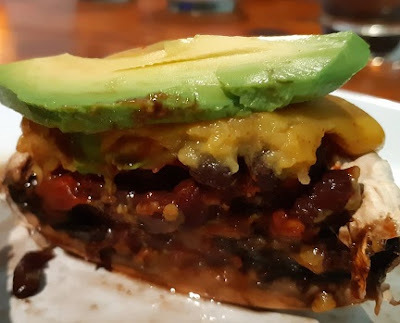 Today's vegan mofo prompt is "The Anti-Vegan"! "tofu really can taste delicious", the simple fact of the matter is that it CAN! So with that in mind, I used tofu to inspire my dish for today. yet how many of them have actually tried good tofu I wonder?!?!? or totally lip smacking depending on how it's cooked and flavoured. 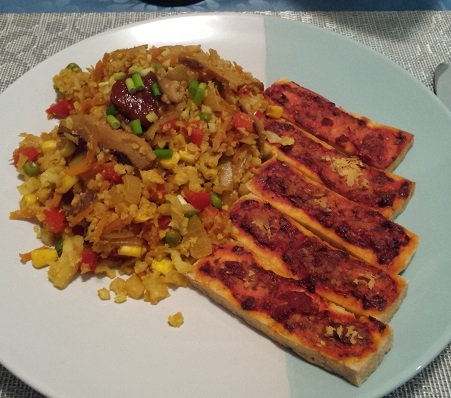 Different types of tofu work in different ways too and learning how each of them work and what they are best suited for is a HUGE contributing factor to how well your tofu will turn out! But explaining the different types is a long post for another day. cooking it in a pan! It really took my love of tofu to a whole new level! 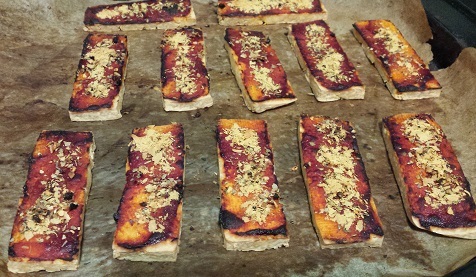 I love experimenting with various forms of baked tofu now! Today - I'm hoping to inspire your tofu taste buds with this simple recipe idea! stress over getting the tofu perfectly dry. Slice the tofu into approx. 1cm thick pieces. until cooked as you desire. Feel free to add veggies to your pizza bites if you want to! What's your favourite way to cook/prepare tofu? I did a whole series of cookbooks for 2014 vegan mofo which you can check out here. So today's inspiration doesn't really come from a cookbook (as set out on the mofo list), but instead from a retreat I stayed at last year where it was lovely to have someone else cooking for me! To be honest, I didn't exactly enjoy all the meals as I felt they were too heavy and so loaded with oil and somewhat lacking in flavour. However I used the idea behind a salad that was served to create this dish myself. I'm pleased to report I've since found another retreat that gladly caters to oil free requests and it's simply divine to stay there! 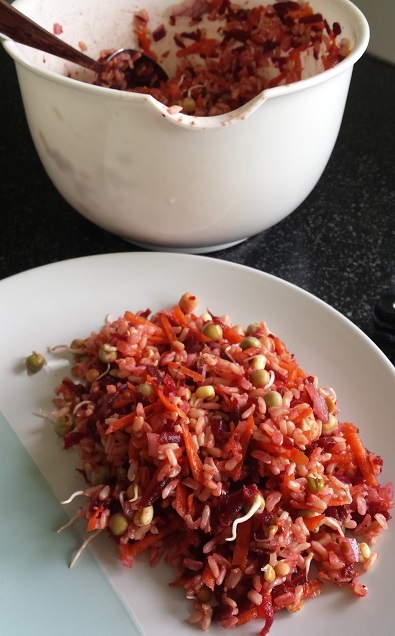 This rice and beetroot salad is so delicious, and with cooked rice already on hand, it's super quick and easy too. Grate the carrot, chop the onion and beets. Stir all ingredients together and you're done. Today's Vegan Mofo prompt is "Artist inspired" – Art comes in many forms – how can you use it to inspire you? I can't say I'm a very 'arty' type of person. I would love to be able to do incredible paintings or drawings but it's just not me! 1/4 cup torn fresh basil leaves. Mix until the basil leaves are evenly distributed. Spread the tomato mixture over dehydrator trays in a thin but even layer. Use a pizza cutter to slice into cracker size pieces. These super easy crisps are fantastic by themselves, or they make great crackers for hummus, tofu dips, and other dips and spreads. Today's inspiration is bought to you by a person! I had to think about this one as I don't know that I am hugely inspired by other people as I do quite like to be my own person but then this idea came to mind! It's original inspiration came from Nigella Lawson! I used to LOVE watching her cooking shows and I recall one time her commenting how well pear and chocolate go together. I have to admit that I've never actually tried any of her recipes, nor do I recall the recipe she made to make that comment!! But I did keep in mind this flavour combo and started to experiment with this combo of flavours, and yes, I can say that indeed pears & chocolate do go incredibly well together!!! 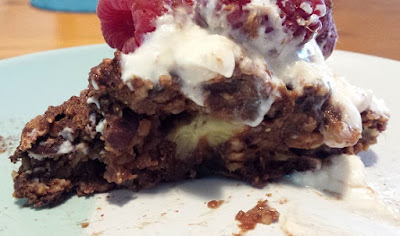 Here's my take on a delicious, yet healthier version of pears and chocolate combined! Using overripe pears in this recipe means you can use far less sugar than in traditional baked desserts as they are naturally more sweet. If you don't have overripe ones, that's fine too, under-ripe ones will work quite well and will soften as the dish is baked. This is a great way to use up any spare pears you may have if you've stocked up when they're on super special (speaking from experience)!! Slice the pears into thin pieces and remove any of the core. Layer in a 24cm pie dish with the large side out and the small ends meeting in the middle as shown below. In a mixing bowl combine the flour, baking powder, sugar, cocoa powder, cinnamon, vanilla and milk. Mix together til just combined using a whisk. 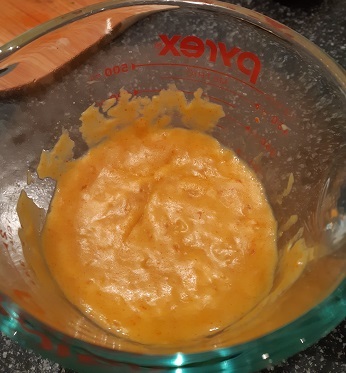 Do not over stir as the mixture will then become too chewy as it bakes. Pour the batter over the pears. Place dish in a preheated 180°C oven and bake for 40 minutes. I find using a glass pie dish that it doesn't stick and can be served easily enough, however if using a ceramic or other dish, I would recommend lining it first with non-stick paper. 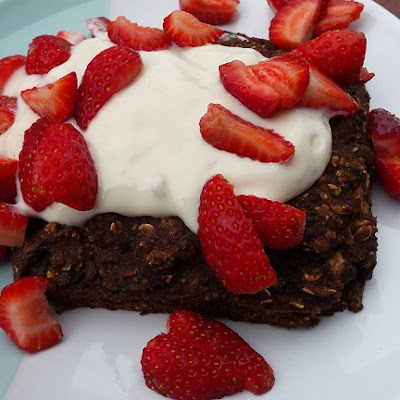 If you wish to try a completely sugar-free version I reckon you could substitute the coconut sugar for 1/4 cup of date spread without it hugely affecting the way this bake turns out. This vegan MOFO I'm hoping to follow along the plan that has been set up! You can see a list of the upcoming themes and prompts by clicking here! That means I'm starting the month off with Inspiration Week! 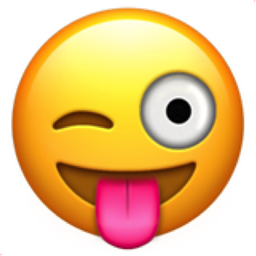 Today's inspiration is bought to you by Emoji's!!! When I was thinking about emoji's I checked my phone to see my most recently used ones to get my inspiration, and other than smiley faces and blowing kisses (mainly to my husband!) my most commonly used ones are the tasty face and a thumbs up! Generally speaking I use the 'thumbs up' emoji when I'm thinking "too easy"! So today I bring you a simple creation that truly is tasty and is so quick and easy it's worth a thumbs up! Combine all the ingredients in a mini food processor and pulse until the mixture forms a smooth spread. Use as soon as it's made because the banana will begin to brown if stored. 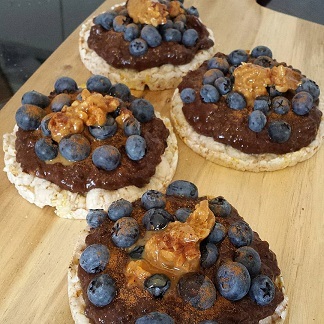 Delicious served over rice-cakes, with berries, nuts and/or nut butter! 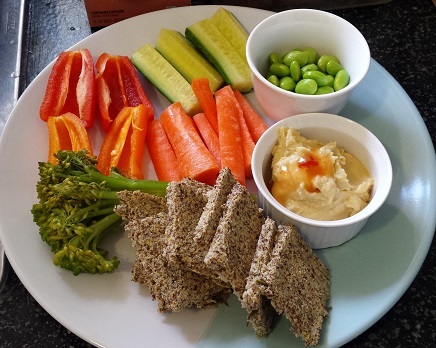 This spread is delicious and has no 'beany' taste due to the other ingredients! 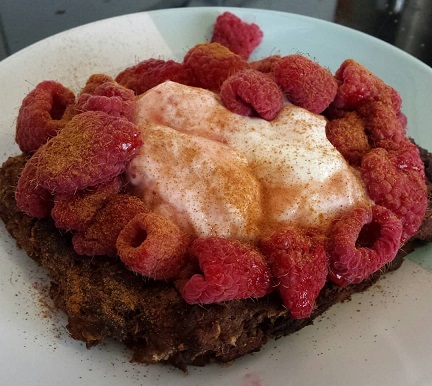 Want to try another delicious alternative - replace the white beans with black beans and substitute the lemon juice for 1/2 teaspoon cacao powder! And don't forget to use the 'tasty' emoji if you take a picture!! !